2018.10.01: Since When Is the FBI Your Friend? 2018.05.03: 'This Is Not America. This Is Not Who We Are.' Except It Is. 2018.03.28: The Invasion Of Iraq Wasn't a 'Blunder,' Or Even a 'Colossal Mistake.' It's a Crime We Won't Forget. 2018.01.15: How Did a Crime Become a Policy? 2017.11.02: Would You Buy a Robot from John Yoo? 2017.02.07: So Who Is John Yoo, Exactly? 2017.02.01: War on Truth "A Funeral Pyre for Science"
2016.11.11: Jose Rodriguez for CIA Chief? 2016.08.01: What Kind of Government Tortures Children? 2016.07.20: Should It Really Be Permissible to Kill People Simply Because We Are Afraid of Them? 2016.07.14: Who Is the "We"? 2016.05.24: Donald Trump Is Coming!??? 2016.05.18: Truth Can't Be "Disappeared"
2016.04.27: Bernie Sanders' Bottom Line? 2016.04.07: We Could Do Worse Than Justice Garland -- But Why Settle? 2015.12.31: "I Didn't Know You"
2015.12.02: How to Defeat U.S. Terrorism? 2015.11.11: Indefinite Detention "The Tragedy At The Heart of Guantánamo"
2015.10.18: "That's Him," Mohamed Ben Soud Said, Pointing at a Photo of James Mitchell. "He Was There." 2015.10.15: Shut Down Rikers, "New York's Abu Ghraib"
2015.09.27: What Life After Guantanamo? 2015.07.09: Where Is the Freedom and Justice For All? 2015.06.12: How Did Abu Zubaydah Lose His Eye? 2015.06.11: Medical Professionals Appraised "Fitness" for Torture... How Sick is That? 2015.05.20: Yoo: "I Will Be On Leave in the Fall"
2015.05.20: Video: "Secrets, Politics and Torture"
2015.05.18: Pete Townshend Records "Guantánamo"
2015.04.18: Human Rights Are Not "Negotiable"
2015.04.16: Can the President Kill You? 2015.01.06: Will Sujit Choudhry Allow John Yoo to "Do It Again"? 2015.01.06: Fire, Disbar, PROSECUTE John Yoo! 2014.12.10: CIA Torture "More Humane Than Drones"
2014.11.26: With a Prosecutor Like Robert McCulloch, Who Needs a Defense? 2014.08.04: Partners in Torture: Where Are They Now? 2014.06.18: On June 18, 1948, the United Nations Commission on Human Rights adopted its International Declaration of Human Rights. 2014.06.04: "I was at the CIA when the torture program was conceived." 2014.05.24: The Drone Memo's author should be in jail. 2014.04.21: "the American justice system is only as good as the worst practices it tolerates"
2014.03.26: Berkeley Law presents "The Twilight of Human Rights Law"
2014.03.07: Honorary degree for Condoleezza Rice? Not if Rutgers faculty have anything to say about it. 2014.02.13: Torture Professor to expound on Korean law? 2014.02.05: John Yoo for Dean of Boalt Hall? 2014.02.01: anti-torture lawyering in the U.S.
2014.01.19: Why Guantánamo? Why me? 2014.01.16: We don't need an excuse to shut down the prison camp at Guantanamo Bay. 2014.01.07: Once again, the question of whether the government should do something is getting less attention than the question of whether it can. 2013.12.18: Why is one of the central perpetrators of a systematic torture regime (still) teaching? 2013.12.08: What is it that makes weaponized drones more 'humane' than land mines, poison gas, cluster bombs, biological weapons, nuclear weapons, and other weapons worth banning? 2013.11.14: If Jeh Johnson gets his way, we can kiss Miranda rights goodbye. 2013.11.14: "Simply put, US drones kill"
2013.11.10: author interviewed, "Blood On Our Hands"
2013.11.09: Shaker Aamer: "the Martin Luther King of Guantanamo Bay"
2013.11.05: A fresh start for UC Berkeley? 2013.10.24: How to Stop Military Aggression Against Syria? 2013.10.19: In a little noticed angle of the debt-ceiling deal, the Senate voted to confirm Stephen Preston, currently the CIA's top lawyer, for the same job at the Pentagon. 2013.10.17: What is the actual purpose of the President's drone campaign? 2013.10.04: twelve years of agony: How could this have happened? 2013.09.09: No one has the authority to bomb Syria. 2013.09.05: When John Yoo is Your Lawyer. 2013.09.01: If the U.S. Congress endorses the bombing of Syria -- and it's very likely they will -- does that make it right? 2013.08.27: Tired of the "humanitarian intervention" excuse for yet another war? You're not alone. 2013.08.02: yesterday was the eleventh anniversary of Yoo's "Torture Memos"
2013.07.28: If this were a country that honored the rule of law, the Attorney General would not need to promise not to torture. 2013.07.25: where's the "fresh start" for prisoners? 2013.07.18: "some of that stuff is just going to have to work its way through"
2013.06.18: We stand in solidarity with the Guantanamo hunger strikers, well into their fifth month of resistance to indefinite abuse. 2013.06.13: Guantanamo Bay a Medical Ethics-Free Zone? 2013.06.08: "safe and respectful" treatment of Guantanamo prisoners??? 2013.05.24: "Gitmo hunger strike will continue until they see a plane to take them home"
2013.05.23: what's happening at Guantanamo? 2013.05.08: Close Guantanamo NOW! Stop the Torture! 2013.05.03: Having a tube jammed into your nose is just what it sounds like. 2013.05.02: the lives of "others"
2013.04.16: Guantanamo: how will WE be judged? 2013.03.14: targeted killing: what's law got to do with it? 2013.03.06: are you on that "kill list" yet? 2013.02.21: Who is "dangerous"? And who decides? 2013.02.06: who is suspect to Obama's kill list? 2013.01.23: Zero Dark Thirty a harbinger of things to come? 2013.01.14: Compliance: How far would you go? 2013.01.14: CCR President Michael Ratner on "the big issue"
2013.01.08: What kind of society does the United States want to be? 2012.12.17: the truth is not "open to revision"
2012.12.16: The President has learned some interesting lessons from John Yoo. 2012.12.13: This morning, the cover-up ended. 2012.12.06: "there is no better time to close Guantanamo"
2012.11.26: how long will the President get away with murder? 2012.11.25: end the "conspiracy of silence"
2012.11.04: how did a minority of wingnuts take over the country? 2012.10.23: how does 'outing' a torturer hurt the national security of the U.S.? 2012.09.19: extraordinary rendition ''incompatible with democracy"
2012.09.09: will U.S. transfer Bagram prison to Afghans? 2012.07.02: If not us, who? If not now, when? 2012.06.28: Obama's drone program goes far beyond what Bush ever did. 2012.06.22: "In a state with rights, people are not kept in cages." 2012.05.22: It began with one document. 2012.05.17: "The fate of the [Guantanamo] detainees, now numbering 169 and in some instances entering a second decade of confinement, was after all never the court's principal interest." 2012.05.02: "we assume without deciding that Padilla's alleged treatment rose to the level of torture"
2012.04.23: Vice President Condoleezza Rice? 2012.04.18: "The government position on torture is well known"
2012.04.04: US interrogation techniques "a felony war crime"
2012.04.02: "In the end, the most telling critique of 'War Powers' may simply be that its conclusions are completely at odds with what we know of the purposes and concerns of those who wrote and ratified the Constitution." 2012.04.02: Homeland Guantanamos no "Holiday on ICE"
2012.03.29: who killed Al Hanashi? 2012.03.17: "Torture, Transfers, and Denial of Due Process"
2012.03.12: "the inevitable excesses that soldiers commit when confronted with the atrocities of war"
2012.03.08: The president cannot ignore the law. 2012.02.21: "It's worse than Guantanamo"
2012.02.09: "Torture is not the issue I would have picked," Allyson Caison says. "But this happened in my back yard." 2012.01.30: Obama administration has "entrenched a system of arbitrary detention." 2012.01.20: Can the President Kill a U.S. Citizen without a Trial? 2012.01.18: torture inquiry "without precedent"
2011.12.19: sole judge, sole jury, now sole executioner? 2011.10.29: "There are more ways of torturing a person than you can imagine"
2011.10.27: October 26: "a day to mourn our lost freedoms"
2011.10.26: Berkeley a "city of refuge"
2011.10.22: "We came, we saw, he died"
2011.09.28: "Guantanamo of the Rockies"
2011.09.11: Berkeley Law complicit in obstruction of justice? 2011.09.06: Torture isn't a policy matter. 2011.08.29: Yoo's opinion "does not reflect the current analysis of the department"
2011.08.03: "unnecessary, indecent and inhumane suffering"
2011.08.03: Do the feds really think ACLU can be "bribed" to drop torture cases? 2011.08.01: Torture: Just how long can this "conversation" go on? 2011.07.27: Torture: Out of sight, out of mind? 2011.07.06: Berkeley's 2048 PROJECT? The world can't wait for justice. 2011.07.04: United States turning 235 "a morally precarious moment"
2011.06.23: US House of Representatives Disrupted With Calls to "Close Guantanamo!" 2011.06.16: We don't need no stinkin' approval! 2011.06.13: ACCOUNTABILITY, BRADLEY MANNING, THOMAS DRAKE & TAKING ACTION! 2011.06.06: There are currently more than 1,700 detainees at Bagram, up from over 600 at the end of the Bush administration. 2011.05.18: Higher Ed, last refuge of war criminals? 2011.05.07: Torture: not open to "debate"
2011.04.30: Law Day 2011: "The legacy of John Adams, from Boston to Guantanamo"
2011.04.26: yet another euphemism for TORTURE: "areas of potential exploitation"
2011.04.19: from Abu Ghraib to Guantanamo: No "Fixing Hell"
2011.04.19: "I'm Sorry My Government Tortured You ..."
2011.04.14: Report from the Field: "Yoo and Bush 6 Must be Tried for War Crimes"
2011.04.02: More Damaging Than Abu Ghraib? 2011.03.28: Has Barack Obama lost legitimacy to remain in office? 2011.03.27: Mon dieu! People still listening to Stephen Hadley? 2011.03.22: Dr. Bruce Jessen's "Torture Paper"
2011.03.09: "Libya would be Obama's war"
2011.02.28: Torture: What Is to Be Done? 2011.02.25: Center for Constitutional Rights hails major victory in "first real investigation of the U.S. torture program"
2011.02.16: "there's something about the crimes committed by the Bush administration in our name that haunts me"
2011.02.15: "How many law professors have signed off on a death warrant?" 2011.01.19: Schools compete for "Leadership"
2011.01.16: Sign Statement: "Close Guantanamo with Justice Now!" 2011.01.14: how many jobs could be spared by canning John Yoo? 2011.01.14: Court defends right to torture "nonresident aliens"
2011.01.12: Close Guantanamo with Justice, Now! 2011.01.11: Christopher Edley misapplies the principle of "academic freedom"
2011.01.09: can Yoo keep a secret? 2010.12.27: Silence in the face of Torture: "the collapse of respect for law among American law professors themselves"
2010.12.22: "Can the President Be Torturer in Chief?" 2010.12.10: how will Christopher Edley justify Yoo's latest diatribe? 2010.11.21: new Yoo Tube from one of our readers: thanks Sharon! 2010.11.20: who was John Yoo's client? 2010.11.14: Bolton and Yoo: Why Rush to Cut Nukes? 2010.11.11: Cashing in on Torture... or a ticket to jail? 2010.11.09: "International law is included... in the Agency's operational risk calculus for covert operations." 2010.11.09: Lawyers for the Obama administration Defend "Kill Lists"
2010.11.03: "Imperialism, Islamophobia, and Torture"
2010.11.01: since when is fighting foreign occupation a "war crime"? 2010.10.30: Undermining international law, President accommodates torture and assassination. What next? 2010.10.21: SCOTUS watch: one step closer to Mustapha Mond's World State? 2010.10.18: "You Don't Like The Truth: Four Days Inside Guantanamo"
2010.09.29: "CRIMES ARE CRIMES - NO MATTER WHO DOES THEM"
2010.09.13: "New Order, Same Abuses: Unlawful detentions and torture in Iraq"
2010.09.12: the Torture Team: where are they now? 2010.09.09: "Torture Is a Crime, Not a Secret"
2010.08.15: "THOSE WHO CAN'T, TEACH"
2010.08.14: Torture is a "real-life problem"
2010.08.06: Veterans for Peace present "Torture: Perspectives & Consequences for the Torturer"
2010.08.05: "a green light to torture"
2010.08.04: UC Chancellor Robert Birgeneau "OK" with Torture... are you? 2010.08.02: "Obama Bravely Takes on a Tortured Child Soldier"
2010.07.29: eight-year anniversary of the "torture memos"
2010.07.27: questions for the Torture Professor? 2010.07.26: evidence of Torture in Afghanistan documents? 2010.07.24: face to face with a torturer -- what would YOU do? 2010.07.23: where is Abdul Aziz Naji? 2010.07.22: "Is waterboarding torture or permissable?" 2010.07.21: the fall guys for Torture, part VIII: Marty Lederman. Who's next? 2010.07.17: the oil spill: "IS IT OVER?" Hell no it is not over. And neither is the investigation of Jay Bybee for war crimes. 2010.07.12: Omar Khadr: military trial a "sham"
2010.07.07: "Gitmo North: if you build it, they will come"
2010.06.29: don't forget those tortured at Camp "NAMA"
2010.06.28: "Obama has essentially dispensed with his campaign promise to close down Guantanamo"
2010.06.01: new video: "GuantÃ¡namo: A conversation this side of the wire"
2010.06.01: Remove the fancy distinctions: the government cannot defeat constitutional guarantee by rerouting its planes from GuantÃ¡namo to Bagram. 2010.05.28: the fall guys for Torture, part VII: Lieutenant Colonel Darrel Vandeveld. Who's next? 2010.05.26: How many torturers are being bred in Barack Obama's two wars? 2010.05.26: Yoo now an expert on Youngstown Steel? 2010.05.25: "the climate had changed, because of Guantanamo and Abu Ghraib"
2010.05.20: the fall guys for Torture, part VI: Dennis Blair. Who's next? 2010.05.19: "What if one of the nation's premier law schools barred hiring former White House architects of illegal torture policies? 2010.05.18: Torture: What should a lawyer do? 2010.05.17: Is Christopher Edley "better than you?" 2010.05.11: Why Do We Go On and On about John Yoo? 2010.05.06: Dean Edley's defense of John Yoo is "dead wrong"
2010.04.29: Obama "accessory after the fact" in war crimes? 2010.04.23: Obama's detention policy: "Bush with a smile"
2010.04.22: What's in a name? Could be torture. 2010.04.21: evidence obtained thru torture ruled "unreliable"
2010.04.19: "an inquiry into the question of whether John Yoo's intentional professional misconduct might call for some form of sanction on the part of the university"
2010.04.12: the fall guys for Torture, part V: Dawn Johnsen. Who's next? 2010.04.08: fresh opposition to "Gitmo North"
2010.03.27: Cass Sunstein on the Supreme Court? 2010.03.23: Berkeley Law: a school adrift? 2010.03.21: the fall guys for Torture, part IV: Eric Holder. Who's next? 2010.03.19: will moral obligations be trumped by political expediency? 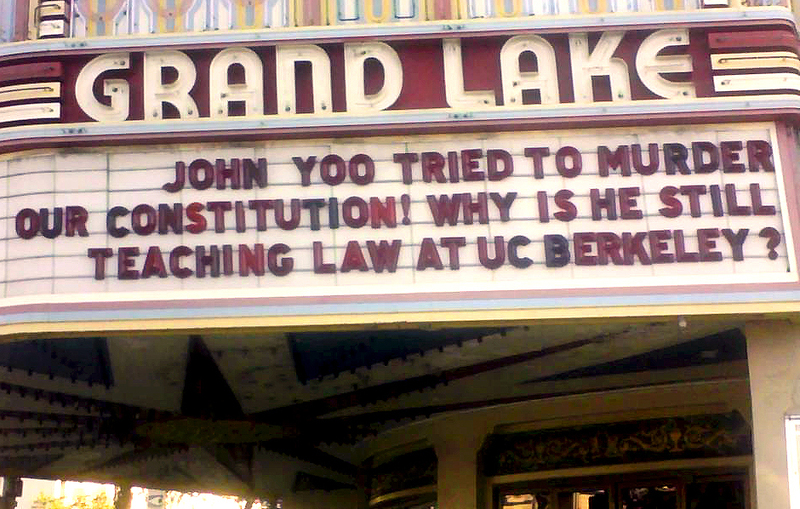 2010.03.17: how far is Berkeley Law willing to go to protect John Yoo? 2010.03.17: "we cannot afford the luxury of only dealing with those [intelligence agencies] that do [not torture]"
2010.03.14: Eight years have passed, and Shawali Khan remains locked in his cage at Gitmo. 2010.03.11: Torture: "if you are not pissed off you are not paying attention....and that pisses me off too." 2010.03.10: What's really missing from that OPR report? 2010.03.06: Torture is wrong. Of anyone. Anywhere. 2010.03.04: making the case against Torture: "if you're willing to break the law, you might wind up a 9th Circuit judge"
2010.03.03: new bar for approving torture: "what you can get away with"
2010.03.01: Who's included in Yoo's email network? 2010.02.24: raising the bar on torture accountability: "The line that matters now is the one between 'poor judgment' and criminality." 2010.02.23: World Can't Wait's response to Torture "Whitewash"
2010.02.21: opening the book on "professional misconduct": just what did those e-mails say? 2010.02.18: Abu Ghraib: where is the outrage? 2010.02.15: Rewriting the Law to accommodate Torture? We think NOT. 2010.02.14: Yoo and Bybee did "what we asked them to do"
2010.02.10: "It is the essential role of the judicial branch to prevent the 'war on terror' from becoming the blank check for official torture that Yoo and the United States (Justice Department) seek"
2010.02.07: dissenting opinion of torture case: "utter subservience to the executive branch"
2010.02.06: Will Obama's mentor respond to John Yoo's attack on his former student? 2010.01.30: Torture report altered; Bush administration lawyers showed "poor judgment"
2010.01.25: "Compared to that [Obama's policy of indefinite detention], the Russian roulette of Algerian justice may not be so bad after all." 2010.01.18: Granting unlimited power to the President: "Can Yoo really be that daft?" 2010.01.08: "We are a country that now accepts torture"
2010.01.05: Torture Architect's "famous erudition and charm"??? 2010.01.05: "The entire nation is suffering for it [John Yoo's theories] now." 2009.12.29: John Yoo: "I deny that I am in denial." 2009.12.24: So who's going to stop the torture? 2009.12.22: "changing the Zip Code of GuantÃ¡namo"
2009.12.14: Rasul v. Myers: opening the door to more torture? 2009.12.14: 5 plaintiffs represented by ACLU in Jeppesen case: will their stories finally be heard? 2009.12.07: "Gitmo meets Lord of the Flies and the Stanford Prison Experiment"
2009.11.30: where is that OPR report? 2009.11.13: Andy Worthington Discusses the Forthcoming 9/11 Trials and "Outside the Law: Stories from GuantÃ¡namo"
2009.11.12: "Now That We Know: Torture, Obama and the Politics of Dirty Hands"
2009.11.11: confronting torture: are the dean's hands really "tied"? 2009.11.05: John Yoo to direct Veterans Assistance Clinic? 2009.10.31: Britain aiding CIA renditions? 2009.10.29: If Torture's not a Hate Crime, what is? 2009.10.29: John Yoo's (and Berkeley Law by implication) Legacy: A Parallel Justice System? 2009.10.26: "The [Torture] Cover-Up Continues"
2009.10.07: Does Torture Have A Statute Of Limitations? 2009.09.30: torture scandal cannot be "contained"
2009.09.28: Bybee's latest Opinion: "protective sweep"
2009.09.27: "Yoo is still telling that same old lie..."
2009.09.24: meditations on torture: "These painted moments, in their stunning tragedy, leap out of their visual confines and somehow manage to implicate us all." 2009.09.24: "A Jury of Prosecutors Would Hang John Yoo High"
2009.09.22: "this issue (torture) represents what it means to be human - or not"
2009.09.22: Protesting UC's Torture Professor: New students ask "how long has this been going on?" 2009.09.18: "The Torture Memos: Rationalizing the Unthinkable"
2009.09.16: The (torture) issue refuses to go away. Why? 2009.09.16: Taking a stand against Torture: "Am I doing enough? Or am I just living out my quiet existence?" 2009.09.14: good FAULT LINES video: "Bush's torture legacy"
2009.09.14: will Pennsylvania take the lead in confronting Torture? 2009.09.10: "Preventive Detention... what the hell is that?" 2009.08.30: outrage over Washington Post article promoting torture, "How a Detainee Became An Asset"
2009.08.28: "once the cat [Torture] is out of the bag, what do you do then? 2009.08.26: "Unacceptable Conduct: Violation of canons of intellectual honesty"
2009.08.11: who will be first to launch a torture inquiry? 2009.08.07: repackaging the "war on terror"
2009.08.06: a crime like torture isn't a "policy question"
2009.08.05: new film: "THE RESPONSE"
2009.08.04: "Colluding in, or failing to report, torture is a crime"
2009.08.02: a blanket excuse for torture, CIA black sites, kidnapping, indefinite detention, the invasion of Iraq and Afghanistan and warrantless spying: sound familiar? 2009.07.31: Gitmo: "a low-tech vision of Hell"
2009.07.29: how John Yoo thinks: Law School Dean speaks to the limits and dangers of "utiliarian reasoning"
2009.07.28: Case Against Mohammed Jawad "an Outrage"
2009.07.27: video: "Sick of Yoo"
2009.07.26: Jeppesen has agreed to presentation of evidence about "extraordinary rendition"
2009.07.24: "What Do We Do Now?" 2009.07.23: the "Chaser's War on Everything" video: "How'd it make you feel?" 2009.07.23: is Obama running-out-the-clock on statute of limitations for prosecution of torturers? 2009.07.18: the legacy of Boalt Hall? 2009.07.17: Yoo still a law professor with University of California Berkeley! 2009.07.15: Mohammed Jawad to return home? 2009.07.14: Holder and President Obama are "rewriting the law written in Nuremberg"
2009.07.11: video: "War Crimes and the White House"
2009.07.08: GUANTANAMO: "the secret place"
2009.06.27: Using Executive Order to subvert the law... is Obama really ready to go there? are you?? 2009.06.26: "... our country is still in the grip of a moral quicksand. We have not faced our own hypocracy." 2009.06.26: anticipating the Helgerson report? 2009.06.16: Accessory after the fact to war crimes? 2009.06.12: video: "Torture on Trial"
2009.06.09: "The Problem of Jay Bybee"
2009.05.07: practice of rendition amounts to "legalized kidnapping"
2009.05.02: Obama to continue military commission system? 2009.04.28: UC Berkeley academic community, Yoo and torture: Is the tide finally turning at Berkeley? 2009.04.23: Since when is the need to adhere to the laws that govern us a left-wing "point of view"? 2009.04.23: a message to the people of Spain: Help the World Prosecute Bush War Crimes! 2009.04.21: who's defending the tortured? 2009.04.19: "Academic freedom" is not the same thing as "immunity for academics." 2009.04.19: legal case against Haynes: the "bar association strategy"
2009.04.18: NY Times Editorial: "That investigation should start with the lawyers who wrote these sickening memos, including John Yoo..."
2009.04.13: referendum on John Yoo? 2009.04.12: Torture apologist: Christopher Edley, Jr.
2009.03.21: cracks in UC Berkeley's "blue line"? 2009.03.20: "Ich habe nur den Befehlen gehorcht!" 2009.03.18: video: Mark Danner on DEMOCRACY NOW! 2009.03.17: "That's who we are. That's what we've become." 2009.03.16: "to the dismay of some of its strongest supporters, the Obama administration has, in every case so far, taken the side of the Bush administration, arguing that these cases should all be dismissed." 2009.03.16: "a stupid publicity move"
2009.03.13: "Everything we continue to hear about Bagram sounds too much like the stories of Guantanamo." 2009.03.13: "a bitter truth for many to swallow"
2009.03.10: "in the interest of the United States"... how about humanity? 2009.03.06: "I Was Only Following Orders!" 2009.03.05: "How did they ever get away with it?" 2009.03.04: Yoo: "These memos... lack a certain polish"
2009.03.03: Where is dean Edley? 2009.02.19: "People v. John Yoo War Criminal"
2009.02.16: "Assessing Damage, Urging Action"
2009.02.14: will Obama "turn the page"? 2009.02.11: "Yoo's ouster is more relevant than ever"
2009.02.09: "Middle Ground" to Confront and Resist the Continuance of Torture? 2009.02.08: "conditions inside the Cuban prison camp have deteriorated badly since Barack Obama took office"
2009.02.01: John Yoo's 2002 Memo: "[B]eyond malpractice" and "raises the specter that [acts of torture] were overlooked." 2009.01.28: John Yoo, War Criminal? 2009.01.28: will Yoo's legal opinions provide cover from prosecution? 2009.01.20: "The Beginning of a New Era of Change"? 2009.01.16: "Yes, Torture is Illegal"
2009.01.11: Torture Defended by the Bush Regime as "Still Necessary"
2009.01.02: where is the outrage? 2008.12.24: "in the final analysis this is about us"
2008.12.22: "Torture Defense Tour '08"
2008.12.21: Biden on Prosecuting Bush Regime for Torture: "I think we should be looking forward, not backwards." 2008.12.21: "So what are you going to do about it?" 2008.12.19: Senate Armed Services Committee Chairman Carl Levin: "...you (can't) legalize what's illegal by having a lawyer write an opinion." 2008.12.18: "If someone commits a crime and everyone's around to see it and does nothing, is it still a crime?" 2008.12.16: "We Won't Live in a Torture State!" 2008.12.12: "profound mistakes in its (Yoo's) legal analysis." 2008.12.06: Why Won't UC Berkeley Investigate John Yoo? 2008.12.06: Could The Bush Administration Order The Torture and Detention of Children? 2008.12.03: Can the United States End Torture? And on what grounds? 2008.11.26: "there's never been a brighter line..."
2008.11.19: What will Berkeley say in the future when someone asks: and what did you do during this time? 2008.10.13: "A War Criminal, Not Controversial Academic"
2008.10.10: "the question of association [with a war criminal] raises broader questions"
2008.09.28: John Yoo: making the world safe for Gitmo torturers everywhere. 2008.09.26: "a soul of the nation story..."
2008.09.16: Guantanamo Trials: Arbitrary Lawlessness in "War on Terror"
2008.09.14: Anyone else having an odd need to have a t-shirt printed up with the word "Youngstown" on it in large letters, getting a plane ticket to Berkeley and walking around campus? 2008.09.03: "darker, larger black hole than Guantanamo"
2008.08.31: "Cop may face charges for racist killing of handcuffed Black youth"
2008.08.18: The US Established a New Category of Human Being Without Rights: "the Terrorist"
2008.08.14: "The Promise of Berkeley"?! 2008.08.10: "...responsibility goes right to the top. That is, to us." 2008.08.06: "Did Boalt Pass the Buck on Yoo?" 2008.08.01: "Should John Yoo, the controversial professor at UC Berkeley, remain employed by the public school?" 2008.07.16: "Creative Rebellion: Cornell Resists Ashcroft"
2008.07.14: "Worries About War Crimes Heat up in the White House"
2008.07.12: "Don't Cry for John Yoo"
2008.07.08: "John Yoo, Totalitarian "
2008.07.06: Complicity in the service of "collegial civility"
2008.07.01: "moral depravity in very high places"
2008.06.26: Town Hall Meeting: 7PM, Friday June 27, 2008, Berkeley - NO TO TORTURE! JOHN YOO MUST GO! 2008.06.17: June is Torture Awareness Month. 2008.06.11: "the fog of secrecy (has) begun to lift..."
2008.06.09: Is John Yoo a Monster? 2008.06.03: Condoning Torture: What kind of intellectual environment has produced this kind of thinking?